What are the Most Common Repetitive Strain Injuries? You are here: Home / Repetitive Strain Injuries / What are the Most Common Repetitive Strain Injuries? How to Fight Them? Carpal tunnel syndrome gets the most attention of all the most common repetitive strain injuries. It’s frustrating when you scour the web for new information on these injuries. Much of the methodology for treating them hasn’t changed. Little research has come out to combat the three injuries we mention below: radial tunnel syndrome, thoracic outlet syndrome and cubital tunnel syndrome. We’ll try to give you an idea of how to begin tackling these injuries and maybe some insight into recent research in all three of these strains. When the ulnar nerve is pinched against the cubital tunnel and cannot ‘travel’ through it. The arm contains several different nerves and “tunnels” where these nerves extend through the arm and toward the spine if you will. In this case, the outer edge of the elbow is one of those pathways. Minor versions of this same injury are akin to your arm falling asleep, say when you wake up having slept on it or bending your elbow at a sharp angle for a long period of time. Pain won’t necessarily become persistent, but if it does be sure to straighten out your arm when you sleep, and don’t bend your arm unnecessarily when you are experiencing pain. There are surgical options if this gets really bad. Endoscopic ulnar neurolysis is one of them. One Chinese follow up study (from the Department of Orthopedics, East Hospital, Tongji University, Shanghai) looked at neurolysis procedures found they were generally successful. Other studies have been careful to pinpoint different surgical procedures for different symptoms of cubital tunnel syndrome. 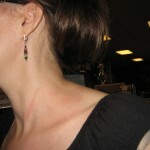 One way to hurt your neck and shoulder is aggravating the area between your collar bone and the top of your ribs. A weak grip is the more serious symptom, as well as numbness and tingling. Shoulder stretches that focus on on the collar bone will alleviate the pain and get the area on track. One stretch prescribes hunching your shoulders forward and back to neutral, plus the opposite arching them backward and then back into the neutral position. There have been experiments with scalene muscle injections to treat pain in this area. One abstract presented at the 2010 Annual Meeting of the American Society of Anesthesiologists (yes, it exists) found that there was near universal pain relief, though about half the patients experienced some sort of numbness. The treatment looks promising according to the report. The radial nerve that wraps around the triceps of your upper arm is potentially subject to repetitive strain injuries. It’s actually a matter of debate whether or not this would fall into that rubric, but treatment is very similar to things like carpal tunnel syndrome. There’s a combo of rest and certain range of motion exercises (ROM exercises). As we’ve described elsewhere, one exercise involves extending the arms out with the fingers dipped down. Then gently pull those fingers back and hold for 30 seconds. Doctors have been evaluating the effect surgery’s had on more severe cases. A 2009 article in the Journal of Bone & Joint Surgery found that more than 80% of patients were satisfied with the results, while half those who weren’t actually were later diagnosed with something else. Surgery is generally rare. There were less than 60 surgeries evaluated overall and only 43 follow ups where patients were surveyed. In general though, the surgery seems to have a positive effect on sufferers. There are definitely more to be on the look out for. Most of the news about these injuries will generally be found on Google Scholar – not in the News sections of your local newspapers or even the daily blogs. If you are trying to follow updates, be sure to check this resource.